Buffdaddy Nerf: Purple Heartbreaker Bow! This version is said to come with an adjustable sight. It does clearly say adjustable sight as one of the features so I am more inclined to believe it but nothing in the pictures proves so. I compared what it said with the normal one and this one doesn't say anything about the dart holder that the normal one comes with yet has it in the pictures? I compared the pictures to see whether the new one was just photoshop of the old one but it is not so I have no clue. This is not the first Heartbreaker bow variation to be released. In stores there is the occassional teal Heartbreaker bow that circulates quite fast and in minute quantities as far as I can tell. 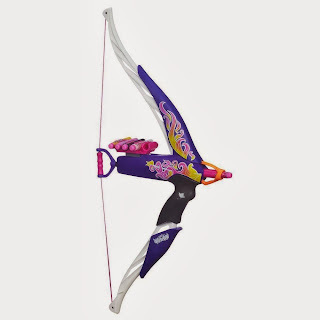 At TRU we carry an exclusive version called the Golden Edge Bow which we sell for about $7 USD more depending on sales and the store - it comes with a small cardboard target and the blaster is base of white with gold paint and gold glitter on it, which makes it relatively gaudy.